The Shashka (Adyghe: Сэшхуэ /IPA: [saʃxʷa]/ - big knife, Russian: (Шашка)) is a special kind of sabre; a very sharp, single-edged, single-handed, and guardless sword. In appearance, the shashka is midway between a full sabre and a straight sword. It has a slightly curved blade, and can be effective for both slashing and thrusting. The blade is either hollowed or fullered. There is no guard, but a large, curved pommel. The hilt is frequently highly decorated. Shashkas from the Caucausus, as opposed to Russian versions, are carried in a wooden scabbard that encloses part of the hilt. It is worn with the cutting edge to the rear, opposite to the sabre. The shashka originated among the mountain tribes of the Caucasus in the 12th century. Later most of the Russian and Ukrainian Cossacks adopted the weapon. Two styles of shashka exist: the Caucasian/Circassian shashka and the Cossack shashka. The typically Circassian (Adyghe) form of sabre was longer than the Cossack type, in fact the Russian word shashka originally came from the Adyghe word - Adyghe: Шашькуэ (Shash ko) - meaning "long knife". It gradually replaced the sabre in all cavalry units except hussars during the 19th century. Russian troops, having encountered it during their conquest of the Caucasus (1817-1864), preferred it to their issue sabres. The Russian Caucasian Corps first adopted it in the 1830s. 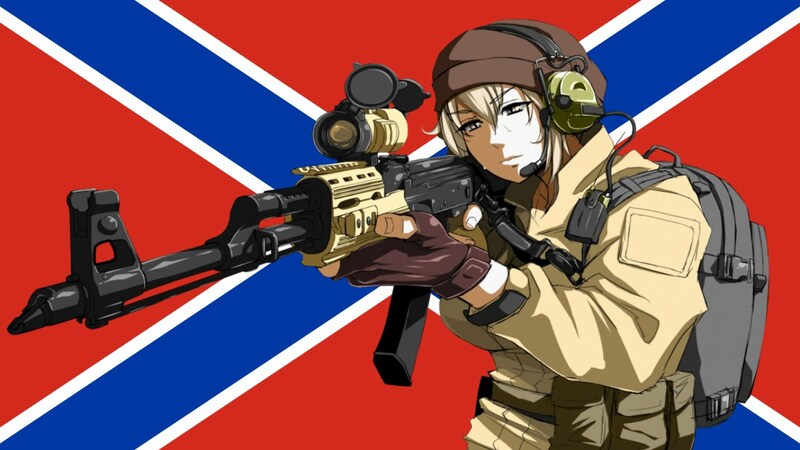 In 1881 shashka became official weapon in Russian troops and police. At this time they were 3 types of shashkas. 1. Caucasus type where the handle almost sits inside the scabbard, this type was used by Kuban Cossack and tribes from Caucasus. Only one problem was with this type of shashka that during rain water could go down into the scabbard, but this type of shashka was very light 300-400 grams, very flexible, strong and sharp. The best and most famous shashkas of this types were Gurda (strong and sharp like bulat), Volchek (running wolf symbol on the blade). 2. 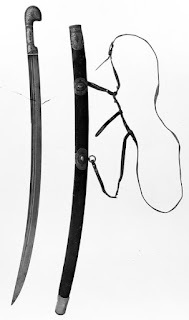 The Don Cossack shashka has straighter blade which gave Cossacks something in the middle to combine two things in one like cutting from the horse and also fence. The weight of this shashka is around 1 kilogram. 3. Terek Cossack shashka, the handle like the Don Cossack shashka does not go inside the scabbard. It is very light and strong. The absence of the guard is inherited from the original Caucasian construction, in which the shashka is nearly completely hidden in the scabbard, together with the hilt. The hilt is slightly curved down, thus providing an additional leverage for pulling the shashka and for additional force by wrist action. The handle of the sabre was crafted so as to have a built-in pommel and possibly a small guard, which usually extended to only one side of the hilt. Like most medieval and then imperial Russian weaponry of the time, often the shashka and its scabbard were very ornately decorated, with gold and silver engravings, embedded gems and stones placed into, and figures carved out of or into, the hilts. The blade of the sabre was generally double or triple-fullered, and due to its greater width than that of the European sabre, and its unique styles of tempering, it was much stronger too, able to deal damage to light body armor. The shashka has the feel of a European sabre and was notable for its sharpness. There has been film footage of Tsar Nicholas II (1868–1918) using a Circassian sabre in an overhead twirling motion to horizontally cut pieces from a wooden pole.